Thank you for your interest in booking a Party at our Syracuse-DeWitt studio. Here at Painting with a Twist we love to host private parties! Bachelorette parties, birthday parties, bridal showers, corporate events, holiday celebrations, kids' parties, and more! To book your party, just email us at studio233@paintingwithatwist.com or fill out the party request form below. * Date and time requested via the Request Party form does not guarantee availability. Someone from our staff will contact you to confirm your desired time slot or advise you on another option. * Parties must be booked at least two weeks in advance. You may request your favorite artist and we will do our best to have them work your event! We look forward to making your event special! This artwork will be sent along with your event details. 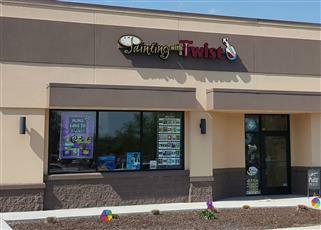 Send me special offers and news from Painting with a Twist.